I have a a XPS 13, 9333 originally delivered with Ubuntu but I need to run Windows 10on it. So far, and after many attempts, I've been totally unable to install Windows 10. I am subscribed to MSDN so i downloaded the Win 10 installer with a new registration key. Trying to install Win 10 booting from USB stops midway (black screen for hours). I was able to install windows 7. Then I tried to upgrade to Win 10 running setup from it. 1st phase (file copying) OK.
2nd phase (driver installation) halts at 25% (40% total) and reboots recovering windows 7 and showing Error 0xC1900101 0x30018 t failed in operation "FIRST_BOOT", ... SYSPREP at startup. Windows 7 installation from which I start is a clean one, no AV, no apps, nohing. Below is a link for driver installation on your laptop. There is a driver install order that must be followed. thanks for your reply but my issue shows well before I can install any Win 10 driver. Basically the installation process stops in the phase shown in the image below (not the real image but just to let you understand) at 25% of "Installing features and drivers" (bottom line) and 40% total (central meter). Is there any way to bypass this and install Dell drivers as you suggested? You can click the links below for information on moving to Windows OS from Ubuntu. Windows 7 is currently up and correctly running on my 9333. The issue above comes up when I try to install Windows 10, both from launching windows 10 setup from windows 7 and when booting from windows 10 setup DVD/USB. Disable all anti-virus, anti-malware, anti-keylogger and/or firewall. Download and update device drivers to latest version manually or check for updates in Device Manager, especially for wireless network adapter and audio inputs and outputs device, and display adapters. If you are using custom device drivers or manufacturer provided device drivers, uninstall them and revert back toMicrosoft default device drivers. Uninstall and remove VPN software. Unplug and remove all external USB and/or FireWire accessories such as sound card, flash drive, memory card reader (SD card) and etc.If you’re using a desktop PC, try to remove all unnecessary devices too such as extra HDD, DVD/Blu-ray drive, except mouse, keyboard and basic video adapter (switch back to basic graphics card if possible). Uninstall and remove PC optimization, tune-up and cleaning software, e.g. AVG PC TuneUp, Ashampoo WinOptimizer, Iolo System Mechanic, SlimWare Utilities SlimCleaner Plus, Anvisoft Cloud System Booster, Norton Utilities and etc. Disable all apps that running in the background, e.g. Dropbox, Google Drive, OneDrive, Flickr, weather apps and etc. Connect to Internet through Ethernet cable instead of WiFi (and turn off the WiFi adapter). Configure in the BIOS for computer to boot to Legacy BIOS mode (disable Secure Boot), or vice versa to UEFIMode. I spent the last 2 weeks trying to do a clean install of Windows 10 on my 2 year old XPS 13 9333, and I finally figured it out. I had the same symptoms you and everyone else had. Upgrades from 7 won't complete, and neither would a clean install. I suspect that the default video driver that comes with Windows 10 is not, for some reason, compatible with the XPS 13 9333. 1. Find another Intel Sandy Bridge, Ivy Bridge, or Haswell system with a mSATA slot. 2. Take the mSATA SSD hard drive out of the 9333, and put it into the other system. 3. Install Windows 10 using the other system on to the 9333's hard drive. Make sure to select the correct version (Home or Pro) that corresponds to the Windows 7/8 version you had on your 9333. If asked for a product key, choose "I'll enter a product key later". 4. 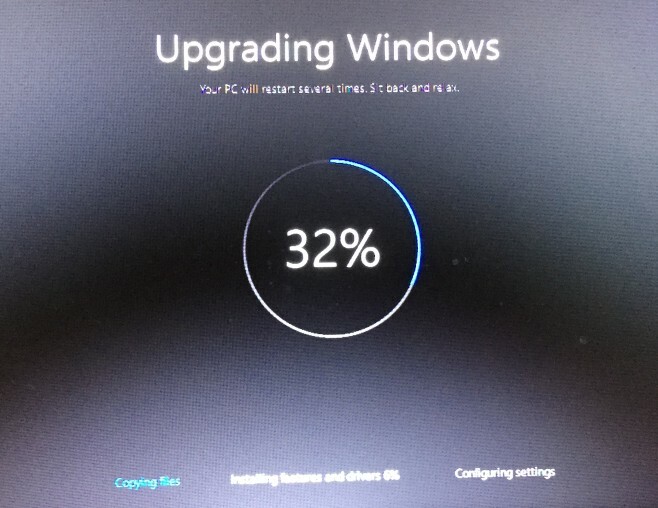 Wait until the Windows 10 install completes and you're at the Windows 10 desktop on the other computer. Turn the other computer off, and put the mSATA hard drive back in the 9333. 5. Turn on the 9333. It will boot but then freeze with a blue screen at the desktop. 6. Hold the power button until the 9333 turns off. Turn it on again, and Windows will ask you if you want to restore the system. Choose advanced, and select the option that will let you boot into safe mode (look up the details online). 7. Boot into Safe Mode. Download and extract the Windows 10 drivers for you system (especially the video driver), and install all the drivers--especially the Intel HD Graphics driver--through the Device Manager. 8. Reboot, and the 9333 should start normally. 9. Finally, run a program called OemKey.exe on your 9333 to read the original Windows 7/8 product key from the computer's BIOS. It will work for Windows 10 as long as the level (Home or Pro) is the same. Use that key to register and activate Windows.